Eric Avar once again changes the game with simple functionality. Every so often in the world of hoops footwear design, new ground is broken in terms of innovation on the aesthetics or performance front, as for several decades now we've been fortunate enough to have seen some tremendous sneakers make their way out of Beaverton, Oregon. Namely, the Flightposite I, Zoom LeBron II, Zoom Huarache 2K4 and Hyperdunk have all been bright spots this decade from Nike Basketball, each leaving a lasting impact well after their release dates. For the past five years, the shoes that Kobe Bryant has worn in the Zoom Huarache and Zoom Kobe line have consistently been that year's top performer, blending together a similar sleek appearance with the performance touch of Eric Avar, Senior Designer in Nike's top-secret Innovation Kitchen and the man responsible for most of Nike Basketball's classics from the 1990's. Nearly two years ago, Avar set out to tackle the fourth signature shoe for Kobe Bryant, and in doing so they met several times along the design timeline to throw out ideas and concepts. As Avar recalls, Kobe has never been more clear with the direction he wanted to go. "He always comes with a deep, insightful and almost philosophical point of view of inspiration, whether it's an inspiration on the metaphor side but also on the performance side," he begins. "This one, in particular, was on the performance side, and he said, 'I want the lowest, lightest weight basketball shoe.' I asked him, 'You mean, like a height?' 'Low top,' he says. 'Soccer, Mercurial-type low?' I asked. He just looks at me and says, 'Yes!'" From there, Avar had the perhaps-daunting task at hand, and he set out to design the lowest sneaker yet in the Zoom Kobe line. The plan was hardly crafted for the sake of simply being a low, however, as both Avar and Kobe agreed that they could bring his foot lower to the ground for better control and stability, free up his ankle for a better range of motion, and all at the same time reduce the weight of the shoe and decrease the burden on his frame through an 82-game season and well into the playoffs. If you're familiar at all with Eric Avar's work (and you better be! ), in the past he has designed organically flowing models like the Zoom Flight 95, Air Penny 2 and Foamposite One around an athlete's style of play that also featured quite a bit of bravado and flair. As great as those models may have been, the Zoom Kobe IV takes things to an even more fundamental and natural level, ridding away any unneeded panels or elements and sticking to the basics that have made Eric Avar's career so successful up to this point. 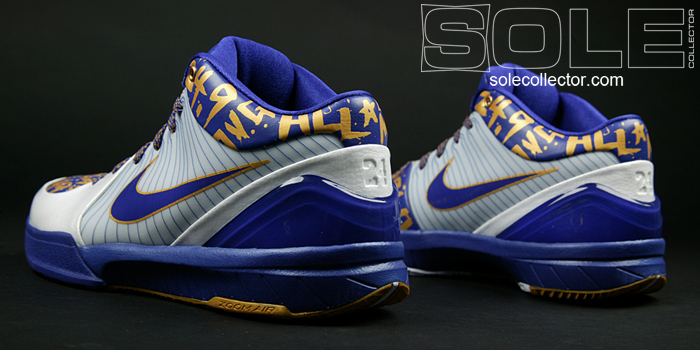 In a way, the Zoom Kobe IV is a culmination of all of the principles that Avar has become so well known for. The shoe is hardly as striking upon first sight as many in his portfolio, and yet it carries over proven elements from some of his greatest hits. It's essentially a better fitting, low-top Hyperdunk with splashes of the Huarache 2K4's base and cues like a full herringbone traction pattern, an outrigger and Nike's Flywire paneling along the way for added protection and efficiency. Better yet, it plays like the shoe Avar was meant to design. While much has been made about the busyness we saw in basketball footwear at the start of the decade with mechanical cushioning and one-and-done technologies coming and going and the more pricey options available today such as the Air Jordan 2009 and Foamposite Lite, the Zoom Kobe IV is keeping things modern in a simplistic and organic package. Gone are the cumbersome straps, lace covers, platform style cushioning systems and gimmicks that have become an annual expectation in this category for years, and the result is a great performing shoe that features traditional laces, a toe support overlay, herringbone traction and one sweet ride at a relatively affordable price. It's basically the footwear industry's interpretation of the iPod, offering everything needed in a simple manner for its intended purpose in an easily understandable and adoptable package. The iShoe, if you will. 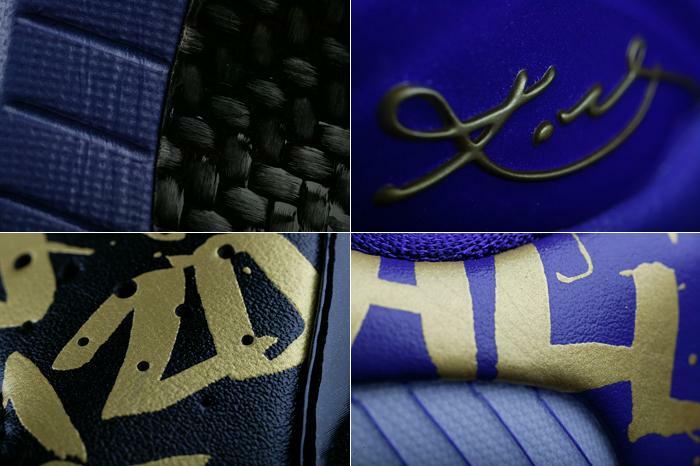 Above: For designer Eric Avar, giving Kobe the lowest and lightest shoe possible was the ultimate goal. In the world of footwear, you can overdesign a product with materials, contraptions and gimmicky technologies that might claim the world, but when it comes down to it, a shoe needs to be a tangible performer right out of the box, at a price that's reasonably attainable for the everyday baller. By placing less of an importance on briefing the design around a singular inspiration or detailed and loosely related backstory, Eric Avar was able to do what he does better than arguably anyone else in the entire industry - design a great basketball shoe. When Kobe sat down with his trusty crew of Kitchen designers to plan out the Zoom Kobe IV, indeed he wanted a low-top, but whether or not this shoe would work with jeans was of zero importance to him. "That's never even something that's crossed my brain," says Bryant in a phone interview. 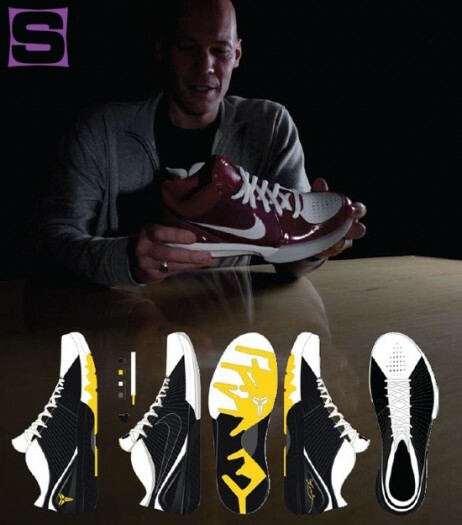 "This shoe, I personally wanted to play in. Whether it [works] well off the court or not, is really irrelevant to me at the time." Challenged to make the lowest and lightest shoe yet for one of the sport's most agile and explosive athletes, and it's worth mentioning that Kobe is also quite a valuable asset to Nike, Eric Avar and his team of researchers didn't dare push forward with the idea before conducting countless hours of biomechanical tests in the Nike Sports Research Lab. Afterall, there's been an age-old adage throughout basketball circles that mid-top sneakers were the golden standard, and playing in a low-top would only put a player at risk for injury, or so we've been told. According to Matt Nurse, Senior Researcher at the NSRL, that isn't quite the case, as securing the foot around a stable base in a low-cut height allows for a shoe to provide the same stability and support benefits found in a more traditional mid-cut height. Nurse asserts that 50% of all ankle injuries are the cause of contact with another player, and 80% of all ankle injuries occur in the paint, meaning oftentimes an ankle injury is the result of an awkward landing on another player's foot while coming down from a rebound or after a shot in the key. Back in 2005, Kobe missed 16 games with the worst ankle injury of his career, which coincidentally happened while wearing the Huarache 2K5, one of the tallest shoes he's played in. If there's one thing that Kobe and the team of designers and researchers at Nike are hoping to prove with this lower cut Zoom Kobe IV, it's that a lower midsole height and stable base can provide all the support that's needed to play basketball at its highest level, and even beyond that, a well executed low can provide more support and stability with its lowered stance and improved fit. In order to get to that stable base and supportive upper, the shoe itself needs to be closely sculpted and contoured to the foot for a lockdown feel. "We did look back at the 2K4's external counter and think that really, if we can get the heel to lock in really well, that does a lot of work for us, and then once we get the midfoot more locked down, then you really can begin to bring the silhouette down," explains Tom Luedecke, an Innovation Kitchen Designer alongside Avar that played a large role in helping shape the shoe. "You can't just take any shoe and just chop it lower, you have to do the homework of the internals and how close you can get to the foot. The stability doesn't only come from the bottom, but it also comes from the upper and it's a systematic approach. By ridding the shoe of a traditional internal heel counter and sculpting an external counter around the shoe, the heel is locked perfectly into place once the shoe is laced up, and there's absolutely zero movement within the shoe. 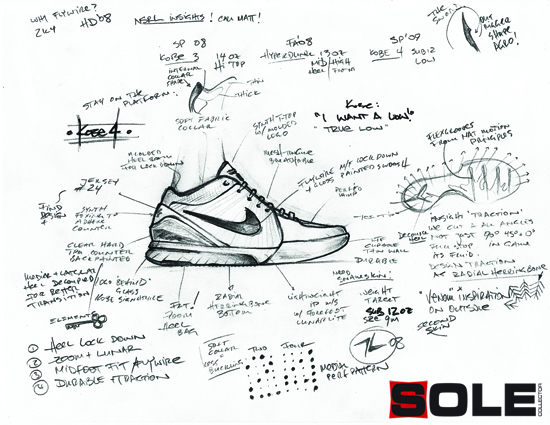 Above: Tom Luedecke spared no effort in helping with the styling of the Zoom Kobe IV's details, some of which can be seen in this sketch during the development process. While playing in a low-top in today's game appears to be taboo for many, nobody knows more about the controversy surrounding heights than Tinker Hatfield, who now serves as Vice President of Innovation at Nike and also keeps a watchful eye on the products the Kitchen crew is creating. If you recall, it was Hatfield who first hoped to bring heights down to a mid-top cut in the Air Jordan III, at a time when hoops sneakers seemed to be reaching near-calf level, and today, he doesn't see any reason why a low-top height should scare off any basketball player. Over twenty years after designing the iconic (and brand-saving) Jordan III, Hatfield can hear the traditionalists still screaming, as the school of thought is once again being challenged to adapt from the sky-high height of the late 80's to the mid-cut that defined the 90's and into the next chapter of footwear with low-top sneakers. As Jordan led the push two decades ago, Tinker sees no better ambassador for lows than Kobe Bryant. "I think it could be huge, because in my mind, he's the best basketball player in the world, all things considered," says Hatfield. "Definitely, people are respecting him for his game and for how I think his personality has changed. He's more gregarious, more of a leader, more tougher and all of those things that people admired in Michael Jordan. You put a low top on maybe Manu Ginobili and people are going to go, 'He's crazy,' but Kobe's a whole other story. They'll say, 'He could do all that in a low-top and he doesn't turn his ankle? Oh, that's pretty cool.' I think it could be huge." With Bryant leading the charge for the low-top campaign, and five teammates also simultaneously wearing the Zoom Kobe IV, the hope is that the true endorsement of the shoe's benefits will be able to change perceptions throughout hoops circles. While the backstory of the Zoom Kobe IV was none other than to simply make a great shoe that clocked in at a lighter weight in a lower height package, surely there's more to this iShoe than just a glossy casing and a couple of buttons. As Luedecke stresses, it's the "internals" of the shoe that do most of the work. Most importantly, every panel is carefully thought out, helping to keep the shoe incredibly light and at the same time maximizing the shoe's support and stability. Starting at the heel, the external counter serves as the framework for support, and right away you're precisely locked in. My foot happens to be of a normal width, if not perhaps the slightest bit on the narrow side, and once you step into the Kobe IV, the first thing you'll notice is how close the shoe fits to your foot. The Jordan XX3 was quite contoured and sloped along both the medial and lateral sides uniquely to the human foot, and the Kobe IV offers an even greater fit as there's no inner discomfort or chafing issues of note, as compared to the XX3's rigid forefoot TPU wrap. While I often refer to the XX3 as "The Gift and The Curse," as for some it's the best playing shoe of all time and for others the most painful on-court experience known to man, the Zoom Kobe IV poses luckily less of an epic dilemma, and if you happen to be a bit on the wider side of the width spectrum, simply go up a 1/2 size and you'll be good to go. 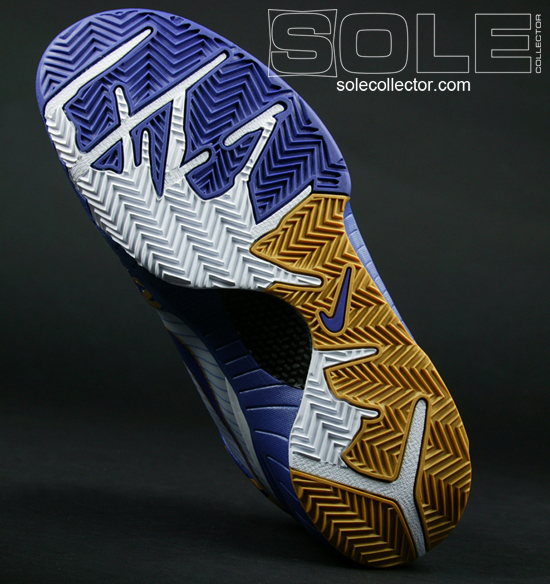 Above: Along the outsole, you'll find a biting full-length herringbone traction pattern. As the shoe's heel lockdown does a perfect job, the collar foam package and midfoot support offer all the protection and comfort you could dream of as well. Thanks in large part to Tom Luedecke spending "close to the entire time process" to get the collar foam just right, there's more padding than you might be expecting along the throat of the shoe, which lends some comfort in the area that has people most nervous. First introduced in the Hyperdunk, the Flywire midfoot panel appears in a smaller role here in the Zoom Kobe IV, and yet it's a large part of the shoe's combination of great fit, support and a light weight. "The external heel counter, the molded internal collar and the Flywire upper, if you get those three elements right then you'll have a very secure and stable upper," says Luedecke. I guess Tom nailed his checklist of items, because it's impossible to complain about the fit of the upper or the comfort of the interior of the shoe, which is fully lined with a mesh innersleeve. Other panels along the upper that perfectly complement the shoe's performance goals include the targeted support rand and the heavily perforated toe vamp. By molding down a support overlay around the toe, the shoe offers great protection for the most active of players. For guards and slashers, your every cut and movement is an assured one, and changes of direction are spontaneous and explosive, holding true to Kobe's eternal quest to "not lose seconds" on his first step. The shoe's outsole is also a large part of that equation, as the precisely radiused heel offers excellent transition upon impact, and the full herringbone outsole works in tandem with the supportive upper to put you in total control of your every move. Because of the upper's no-nonsense approach to construction and incorporating panels you need, where you need them, the end result is a basketball shoe that flexes linearly and holds when stressed laterally. There was never a time during any of my countless wearings of the white/varsity purple/black or black/white/del sol colorways where I felt at risk for injury or as if the shoe would perhaps tip over or lose stability. As Hatfield explains, that's also largely in part to the shoe's lowered overall stance and reduced midsole height. "Stability comes from the fit and the base of support and actually we're continually trying to drop the midsole thickness down [while keeping] the same kind of cushioning aspects," Tinker explains. "Technology is changing so we can keep enough cushioning and just drop that midsole height down and that adds stability." With an emphasis on thoughtful lows going forward that incorporate great fit and lockdown, expect the Zoom Kobe V, VI and beyond to all tell that story. "I've played basketball in all kinds of low-tops, especially if they're a little bit lower to the ground," says Hatfield. "There's absolutely no reason why we can't break that paradigm, and Kobe's the obvious one to do that." While the upper of the Zoom Kobe IV is perfectly executed performance wise, rather than carry on for several paragraphs of eloquent and poetic prose and describe at length the technical componentry within Kobe Bryant's latest signature shoe, I'll just jump right in and say that this shoe is one change away from being lumped into discussion as one of the top five basketball shoes of all time. It's (almost) that good. That change is the need for forefoot Zoom Air in place of the currently embedded Lunar Foam unit, and it's frustrating how such a simple alteration can really make that much of an impact for what is otherwise an above-average performer as is. Then again, I'd like to add songs to a playlist from my iPod too, but sometimes when things become too simple and intuitive, a few details may be left out. Though the new iPod 4GB Shuffle has a glaring design flaw in that it has no menu wheel and can only be operated through an in-line control in the earphone chord, meaning you can't operate it with a car adapter or with alternate headphones, the Kobe IV's main flaw is hardly as monumentally crushing, but it's still a setback. Just as I complained at length in my review of the Nike Hyperdunk, the forefoot cushioning really will bottom out after just a handful of wearings. That's not to say the shoe's low stance and great court feel aren't positives either, and while Lunar Foam simply doesn't cut it for elite basketball, the Zoom Kobe IV is still more cushioned than many other non-Zoom based sneakers. If metered obsolescence isn't something you're all too crazy about, then you may want to look elsewhere, but because of the shoe's so many other bright spots ranging from its conforming fit to its biting herringbone traction and incredibly light weight, it's a flaw worth working with. There's more cushioned shoes out there like the Zoom LeBron VI, Zoom Soldier III or Huarache '08 and '09, but the fit, feel and weight of the Zoom Kobe IV may keep pulling you back. By contrast, the heel Zoom Air unit is perfectly responsive and provides a great deal of cushioning, and if Lunar and Zoom must work together, at the very least I'd love for a reversal of roles. Lunar Foam has proven to give a soft and pillowy feel in a running application at the heel, and taking Lunar to the heel and trusting Zoom Air with the shoe's forefoot duties seems like the perfect compromise. If you're not a bum on the hardwood, most of your time is spent on your toes anyway, and I'd much rather see more of an emphasis placed on more beefy and resilient cushioning up front. As great as the sculpting and shaping of the Zoom Kobe IV is, and I guarantee you'll love the support, traction and transition of the shoe, the forefoot cushioning remains a flaw that simply must be changed. Every single company has researched and tried for years to come up with a match for the lightweight and responsive benefits that Zoom Air offers, and Nike would simply be lowering the bar by moving away from what is far and away the industry's benchmark cushioning system. As the Zoom Kobe IV lays the foundation for a direction within Nike Basketball that will be taking you lower, lighter and more modern in its design, this first departure from height in the Zoom Kobe line is a tremendous success. No shoe has ever been this light without compromising support, and no shoe has ever been this low without compromising fit. With proven commodities like a full herringbone traction pattern outsole, carbon fiber midfoot support shank and support overlays only where needed, it's a shoe that doesn't scream out revolution from the walls of your local sneaker store, and it surely doesn't cry out technological masterpiece with an attention-seeking and more inefficient visible cushioning system, but just like the iPod, the Zoom Kobe IV is basic, simple and made to use for its intended purpose. It's a tremendous basketball shoe in checkpoint fashion, even if that means it doesn't come in at a height that more archaic fans of the sport consider to be the standard. "When you're working directly with the athlete, especially someone like Kobe, it gives you all the justification you need and the confidence you need to make a statement like this," beams Eric Avar. "It's going to start with the IV, and certainly we're going to carry on with the V, VI, VII and so on." Buy it if you play honestly any position, as the shoe's lowered height and stance truly provides all the support and stability you need. 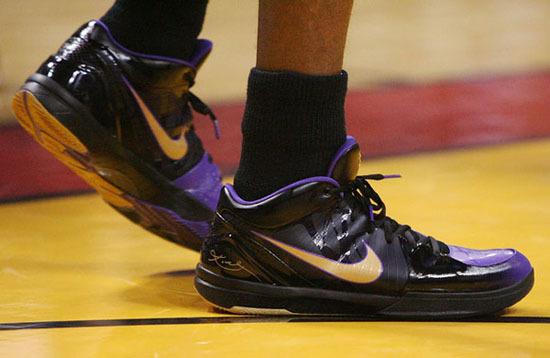 The littlest of guards on up to the biggest of centers all recently wore the Zoom Kobe IV on USC's squad, and while the Zoom Kobe I was wider-based, the II harshly sculpted along the heel and the III lacking a bit in terms of biting traction, the IV is surprisingly the most accommodating sneaker of Kobe's line to date. There's really no quantifiable units of measurement to gauge the shoe's reaction time when cutting or moving, but Kobe swears that the IV helps prevent him from losing seconds on his first step, and sure enough, the combination of a snug fit, low midsole height and a stable base make for the most slasher-ready sneaker we've possibly ever seen. "Kobe's kind of in a league of his own and so I would think that that would give us a pretty good shot at changing basketball shoes," says Tinker Hatfield. "There's just no need for [the mid-cut] really. Going down to another notch lower, I think that's real cool. If I'm a player, I wouldn't want to be stuck in superstition or some sort of old paradigm about what a basketball shoe should be. I'd really want to test out something new and lighter and better." The Zoom Kobe IV is that shoe, taking you lower and more in control of your motions, and all the while offering a total package of excellent fit, traction and lightweight that sets it at the top of this season's hoops offerings.